LED TV Screen.Full HD (1080p) display resolution.Screen size: 49 inchesMotion rate 50Hz.Resolution 1920 x 1080 pixels. Heat added, back to a good price, Argos dropped it to this price before (then up to £379)...gets very good reviews for picture quality in Which? reports. I was personally swayed however by none other than a smart tv, however, the LG50PB660V 50" Plasma for £399 with 5 years warranty. I really did not want to spend more than £400, and those two along with the Panasonic TX-50AS520 (a little over my top end budget of £420) were all in my shortlist. We got this for our sons room last month. I recommended it to a mate the next day but it had gone up by another £30 by then so we were lucky to get it in time before the increase but as already said above, it's dropped in price again now. We also got the special offer of the NOW Tv box with the 3 month Entertainment Pass for half price at a tenner as part of the offers they have associated with the product and and top of that there was the £10 voucher for spending over £100 spend so that was another bonus. Good price for a decent tv. Heat added. Just to check, will this TV allow me to directly use my satellite cable that was previously used for a Freesat box, without the box? It says on the video in the thumbnails next to the phone that it does have freeview HD? Not saying ur wrong m8 as the video may well be wrong, just pointing it out. Just to check, will this TV allow me to directly use my satellite cable … Just to check, will this TV allow me to directly use my satellite cable that was previously used for a Freesat box, without the box? Yes, if it has a satellite input which most LG tvs do have...but check first....although with one caveat. It is not a Freesat tuner..so whilst you will be able to pull in content on Astra 28E like Freesat does it will pull in literally everything. Therefore leaving you to sift through all the PPV crap, regionalised channels, channel order sorting etc. And most importantly of all, it will only feature a now and next tuner rather than the weekly EPG that Freesat gives. It says on the video in the thumbnails next to the phone that it does … It says on the video in the thumbnails next to the phone that it does have freeview HD?Not saying ur wrong m8 as the video may well be wrong, just pointing it out. 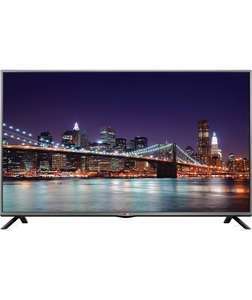 It does have very good picture quality for an LED backlit TV according to Which? at a reasonable price...but most definitely is more suited for those that want a 'dumb' tv that want to feed it external sources like cable tv, freesat/freeview HD pvrs, games consoles with smart tv features etc. Can this TV handles MKV filles with subtitle (e.g. srt)? That description is wrong, it is 100hz. We got this for our sons room last month. I recommended it to a mate the … We got this for our sons room last month. I recommended it to a mate the next day but it had gone up by another £30 by then so we were lucky to get it in time before the increase but as already said above, it's dropped in price again now. We also got the special offer of the NOW Tv box with the 3 month Entertainment Pass for half price at a tenner as part of the offers they have associated with the product and and top of that there was the £10 voucher for spending over £100 spend so that was another bonus. Good price for a decent tv. Heat added. It is 100hz just like the Freeview HD version (49LB550V) Or should I say just like every other LED TV it is via MCI, the panel no doubt is a native 50hz. There is no single UK website showing 100Hz ? I have already said, as with other tvs you will find the panel to be 50hz, but through processing it is 100hz, like the 49LB550V this is 100hz MCI. The TV will be the same spec throughout europe, there are very few sellers of the 49LB5500 in the UK. As with most LCD tvs manufacturers all have their ploy in calling their picture processing different names..LG call it Motion Clarity Index and they claim it to be 100hz. Bought this from Tesco on Black Friday. Had one replaced because of a weird line on the screen. Both suffered really badly from the dirty screen effect (google it). Can't in good conscience recommend this. Even coming from a 720p Plasma, it was a noticeable downgrade. Bought this from Tesco on Black Friday. Had one replaced because of a … Bought this from Tesco on Black Friday. Had one replaced because of a weird line on the screen. Both suffered really badly from the dirty screen effect (google it). Can't in good conscience recommend this. Even coming from a 720p Plasma, it was a noticeable downgrade. Spend the extra £50 over this on the LG 50PB660V Plasma, you won't regret it. Heat added. Bought this for £299 reconditioned and thought it was great value. i got the 42" version of this tv just before xmas, its a great tv. Just be careful of measurements though, as the legs splay outwards from the body of the tv and make it bigger as you can see in the pic. If its 49" to start with the legs will make it roughly 52" wide so be aware when needing a cabinet to put it on we had to send our new 42" cabinet back and get a 50" one to accommodate the legs. I got this tv on Black Friday. Brilliant tv for £330 with 5 year warranty. If you just want a good tv without the frills then this is it. Looks very stylish as well. Does anyone really use 3D and smart anyway? Picked up one yesterday, really impressed with it. I always thought 3D was a gimmick from the get go, and Chromecast does all the functions the Smart TV would do.